Today is Pi Day, did you know? Typically, every year I forget about this celebrated day until I open my Google reader and find many food bloggers posting a pie recipe. Get it? Pi or Pie? 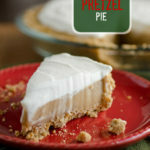 When I decided that I was going to actually post a pie recipe on Pi Day this year (because it’s the first time I remembered to do it in advance) I knew I wanted to lean towards a pie that Ben would love. He is a huge fan of banana cream pie and lately has been asking me to make it. 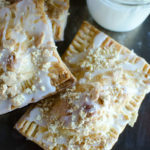 After reviewing some of my bookmarked recipes, I came across this recipe from a fellow Mississippi gal and knew without a doubt that we would love it. 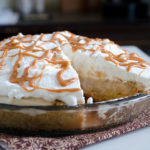 What is there not to love about a vanilla wafer cookie crust, layered with a homemade banana pudding and whipped topping, all on top a butterscotch ganache? 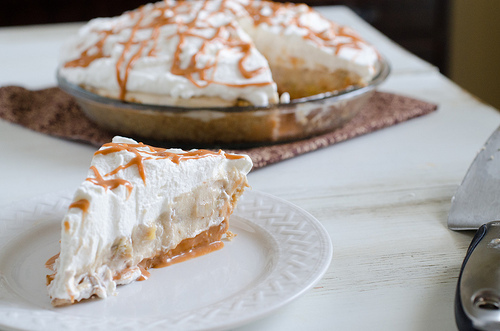 This pie is definitely rich, but SO good. You’ll want a small piece at a time. Lucky for me I have neighbors that make up a family of eight, so I sent the leftovers right over to them to save our waistline. In a medium bowl, combine the crushed vanilla wafer cookies and the melted butter. Press onto the bottom and the sides of a 9- to 10-inch pie plate. Bake for 10 minutes. Place the butterscotch chips into a small heat proof bowl; set aside. Heat the heavy cream and butter in a small saucepan over medium-low heat until the sides bubble. Pour immediately over top of the butterscotch morsels and let stand for 2 minutes. Whisk until the butterscotch chips are melted and smooth. Set aside 3 tablespoons in a small cup and cover for later use. Spread the remaining ganache evenly over the pie crust then place in refrigerator. Layer the bananas in small or medium baking dish. Drizzle with 2 tablespoons melted butter and sprinkle with 3 tablespoons brown sugar and the cinnamon. Bake at 350 degrees, stirring occasionally, for 30 minutes or until bubbly and caramelized. Place 1/2 cup milk in a medium mixing bowl and sprinkle with gelatin. Set aside to thicken for 5 minutes. Heat the remaining 3/4 cup milk and evaporated milk to nearly a boil in a medium saucepan over medium heat, stirring often. Add 1/2 cup light brown sugar, cornstarch, and the egg yolks to the softened gelatin and whisk until blended. Temper the gelatin mix by gradually whisking about a 1/4 cup of the hot milk mixture into the gelatin mixture; repeat this process once or twice using about 3/4 cup of the hot milk mixture. Pour the warmed gelatin mixture into the saucepan with the hot milk and bring to a boil over medium-low heat, stirring constantly. Cook for a few minutes or until mixture is thick and coats the back of a wooden spoon. Strain the hot cream custard through a fine mesh strainer into a large bowl; whisk in 2 tablespoons butter and vanilla extract. Stir in the roasted bananas. Cool at room temperature for about 30 minutes, then transfer to refrigerator for 1 hour to cool. Spread the filling over the ganache in the pie shell and refrigerate for at least 4 hours. Beat 1 1/2 cups heavy cream in a large bowl on high speed until foamy. Add the powdered sugar and 1/2 teaspoon vanilla extract and beat until soft to medium stiff peaks form. Spread evenly over the pie. Transfer the reserved 3 tablespoons ganache into a small resealable bag. Seal bag, pushing out all the air, and press the ganache to one corner of the bag. Cut a very small hole in the corner and drizzle on the top of the pie. Keep pie refrigerated until ready to serve. Can’t wait to try this. Thanks for the recipe, Nikki! Glad you remembered this year. Looks fab! Wow, roasted banana? That sounds amazing. Bookmarking this one! Happy Pi Day! 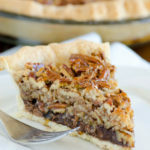 This pie looks amazing!! And I will take a bowl of the butterscotch ganache by itself. You know…for quality control tasting. 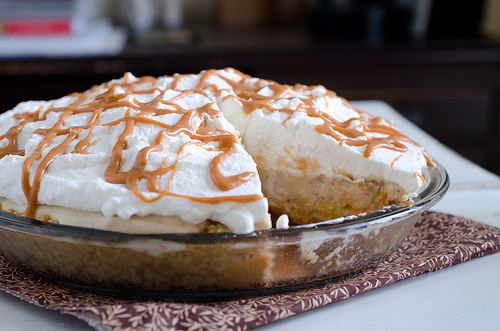 I’m not a huge fan of banana cream pies, but I know several people that are and I bet I would make their heart skip a beat if I made this pie for them. And butterscotch ganache?? I can totally get down with that! You really did nail it on pi day…this looks uhhhmazing!